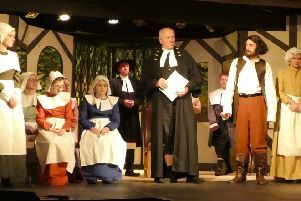 It all turned out right on the night for a play about everything going wrong as it was the winning performance at a young farmers’ drama competition. Stamfordham Young Farmers’ Club stole the show with their performance of A Collier’s Tuesday Tea by Michael Green, taken from the 1978 book Four Plays for Coarse Actors, at this year’s Northumberland YFC drama competition, sponsored by Youngs RPS. Northumberland YFC drama competition best actor Graham Adamson with Emma Fairbairn from Youngs RPS. First staged at the Questors Theatre, London, in 1975, it is a parody of the works of the novelist DH, set in a stereotypical coal-miner’s cottage, and is billed as a story of anything that could go wrong ending up, true to form, going wrong. The table and its legs are the focus of the play, the food being utterly phoney and the pouring of the tea prolific. The cast desperately try to manage each catastrophe, while sporting Yorkshire accents and managing the table. The skill is to keep the element of surprise as each mistake happens because that is very much the main element of the play. Northumberland YFC drama competition best junior actress, Georgia Courage with Emma Fairbairn from Youngs RPS. The humour is in the grimness of the subject matter and its contrast with the total lunacy of its delivery. In second place was Whitley Chapel YFC with their performance of You Just Can’t Trust Them, written by Michael Newbold and set in 1974 on a girls’ school camping trip. Most have settled into camp duties well, with the exception of one rather unsettled camp mate. However, things get more interesting with the arrival of girls from Tile Hill High. In third place, and last to perform on the night, was Cambo YFC. They performed War Rabbit, written by Lesley Grieve, Helen Moran and Jim Scott. War Rabbit is about the Bestfords, an upstanding family in rural Northumberland. As war breaks out in 1914, their only son enlists, along with the gardener and gamekeeper. The drama represents the events and actions that took place as food and resources became reduced during the war. A split stage symbolises the hardship and change that both humans and animals underwent to survive, and an emotional message is sent out. The cast was made up of junior, intermediate and senior members, ranging in age from 12 years to 26. After much deliberation, the judges announced the result, commending all three teams on the high standard of their performances. Stamfordham YFC also swept the floor with individual awards. Graham Adamson received the Best Male Actor’s trophy, and Lucy Adamson, was named as Best Female Actress. Best Junior Male Actor was Danny Wilkinson and Best Female Junior Actress was Georgie Courage, of Whitley Chapel YFC. Because of their success, Stamfordham YFC were given the chance to go on to perform their production at the Young Farmers’ Northern Area weekend held in Carlisle last Saturday.